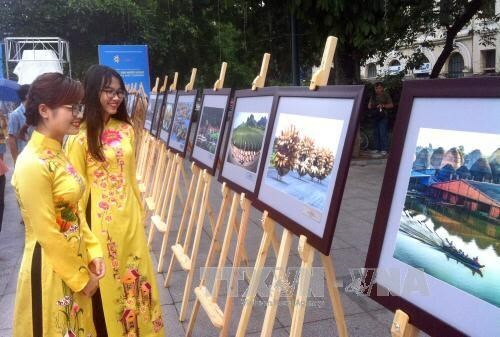 Hanoi (VNA) – As many as 230 photos featuring the landscapes and people of the Association of Southeast Asian Nations (ASEAN) are being displayed at an exhibition, which opened at the Ly Thai To Square in Hanoi on August 5. The event, jointly organised by the ministries of Foreign Affairs and Culture, Sports and Tourism, and the municipal People’s Committee, aimed to mark the 50th founding anniversary of ASEAN. The photos, by 130 artists from the ten ASEAN nations, include 50 on Vietnam and 20 on each of nine other nations. They are selected from over 10,000 entries sent by over 1,200 photographers. At the opening ceremony, Deputy Minister of Culture, Sports and Tourism Vuong Duy Bien said, the exhibition presents opportunities for regional photographers, including Vietnamese to exchange and learn from each other. It is expected to strengthen understanding and solidarity among the nations, contributing to building an ASEAN community of solidarity, dynamism, development, peace and prosperity, he added. On the occasion, 10 photographers, each from the 10 ASEAN nations, were honoured with an “ASEAN Photo Cup” for their outstanding art works.